A torii gate, or shrine gate, stands outside every shrine in Japan. However, the Fushimi Inari Shrine's Senbon Torii are a stunning sight that just resembles some kind of entrance to another world. We tell you why there are thousands of them. Fushimi Inari Shrine in Kyoto is one of 30,000 Inari shrines across Japan. If you have visited Japan, or have seen pictures of famous shrines, then you are sure to have seen the brilliant vermilion torii gate that stand outside Shinto shrines. Some of these gates are decorated with statues of foxes. These foxes are the guardian spirits of the Inari shrines and messengers for the gods. The god Inari is worshipped at Inari shrines. This deity grants a wide variety of prayers, from gokoku hojo (better crop output than last year) to shobai hanjo (business prosperity), and in some regions of Japan, anzan (safe childbirth), manbyo heiyu (being completely cured of any illness), and gokaku kigan (prayers for academic success). For Japanese people, Inari shrines are the most common type of Shinto shrine. The most famous of them is the Fushimi Inari Shrine in Kyoto. Every New Year about 2.7 million people travel from all over Japan to visit this shrine. Those who know the Fushimi Inari Shrine immediately think of the Senbon Torii, or the Thousands of red torii gates. It is said that there are about 10,000 torii lining this road up the mountain to the main shrine building. The sight of the torii all lined up is magnificent, and perhaps one of the most iconic views of Japan. Because of their visual impact, the Senbon Torii have appeared in numerous different works across all kinds of media. These torii gates are not just meant as decorations. If you look closely, there is writing on each torii. This shows that that particular torii has been dedicated to the shrine by an individual or group. This is an act known as hono, or the dedication of valuable items to deities in temples and shrines. 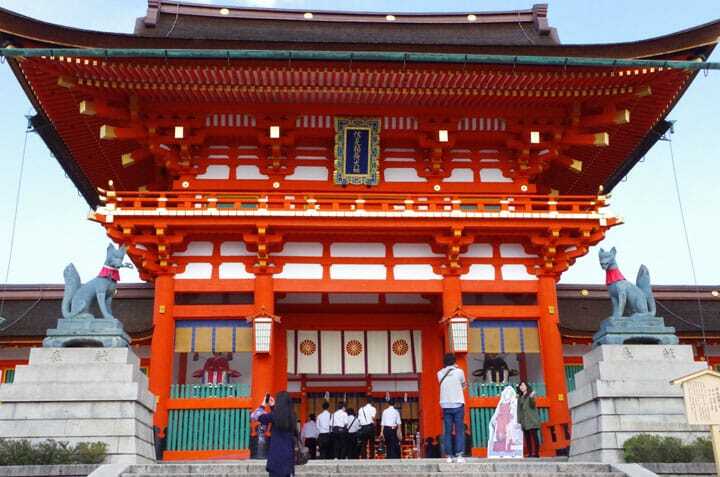 There is a custom that, if wishes come true for someone that has visited and prayed at the Fushimi Inari Shrine, they will revisit and dedicate a torii to the shrine. Most of the time it is sucessful businessman who will follow this custom. As a result of this practice, the impressive and beautiful sight of thousands of torii gates has been created and preserved. This shows just how many wishes the deity Inari has answered. Many people find themselves overwhelmed by the auspicious nature of this pathway as they walk along the torii-lined road. The bright vermilion hue lingers around you, filling your view, and skewing your visual perspective the longer you walk. It is almost impossible to think that you were in a crowded, modern city just a short time ago. The sounds of the river, the voices of the birds in the distance, the clear and crisp air, and torii gates as far as the eye can see. If you would search Japan for an entrance to another world, this would probably be it. Come to Fushimi Inari Shrine and experience its mystical illusion for yourself. You won’t regret it! Let's Explore Kyoto's Most Popular Spot: Fushimi Inari Shrine! Bring Home A Souvenir Fox From Kyoto's Fushimi Inari Shrine! Kyoto's Fox Shaped Rice Crackers - Inspired by Fushimi Inari Shrine! Try Quail Meat At Nezameya, Near Kyoto's Fushimi Inari Shrine!